Reservations can be made by phone, through AirBnB, VRBO or our website. A security deposit and full payment with a valid credit card are required for reservations. We accept Visa, Mastercard, Discover and American Express. As soon as we receive your reservation, we’ll email you a confirmation. When making a reservation, you will be asked to agree to our short-term rental agreement and these policies, consistent with North Carolina law. We know you want to start your Modcabins vacation as soon as possible. Check-in time begins at 4 pm. Early arrival requests cannot be guaranteed, but we’ll try our best! Check-out time is at 11:00 am. We cannot accommodate late check-outs due to the high demand for Modcabins, and the need to prepare the cabin for incoming guests. We pride ourselves on being an environmentally friendly vacation rental. Our cabins and hot tubs are thoroughly cleaned before new guests arrive, but we do not provide room service during your stay. Modcabins will take care of everything else! Modcabins understands that sometimes travel plans change. In order to receive a refund, you must cancel 30 days prior to your scheduled arrival date! There are no refunds for cancellations made within 30 days of your scheduled arrival date or for no-shows, so we encourage guests to purchase travel insurance. Pets are allowed with our signed lease and completed pet addendum. Pets not listed on the pet addendum are not allowed. An additional cleaning fee of $25 will be charged to guests with pets. All of our Modcabins are 100% non-smoking. THIS INCLUDES ALL TYPES OF SMOKING ON THE PROPERTY! An additional cleaning fee of $250 will be charged to any guest who violates the smoking policy. The Modcabins property is divided into three portions for use by each cabin, along the beautiful Shope Creek, at the foot of Pisgah National Forest. We ask that you please be respectful of other guests, stay within the cabin’s designated areas, and be mindful of your noise level. Quiet hours begin at 10:00 pm in respect of our neighbors – this is STRICTLY ENFORCED by property management. Sound is amplified in this mountain valley, so “after parties” will not be tolerated on the property. 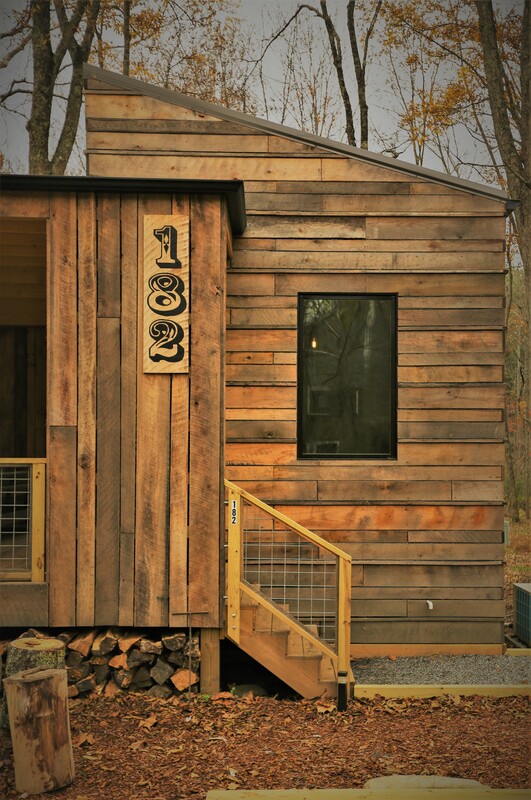 Feel free to host late gatherings at one of the great bars or restaurants in Asheville, and Uber back to the cabins. Downtown is only 6 miles away. There will be plenty of parking for your Modcabin, with at least 2 parking areas for each cabin. Each of our cabins offer a unique arrangement for sleeping, eating and relaxing. Master bedrooms have a queen-size bed on the main level. The larger cabin sleeping loft is accessible by a ladder which is not suitable for adults with mobility issues or small children. For older children, the loft should be used with adult supervision only. Please exercise extreme caution when using the loft ladder and loft. We recommend smaller children and adults with mobility issues use the downstairs bedroom. Please note that our cabins are not wheelchair accessible. By consenting to these terms, you agree that you accept the conditions for the cabin that you are reserving. Modcabins, its owners and affiliates are not liable for any personal injuries resulting from staying in or using the cabins. The signer indemnifies and holds Modcabins harmless against any and all such claims, including attorney’s fee incurred in defense of such claims. While accidents do happen, guests will be held financially responsible for all damages to the property or missing items discovered during their stay and/or immediately upon departure. Modcabins maintains a wait list for nights that are fully booked. To be placed on the wait list, email us at maecreadick@hotmail.com and include the following information so that we can contact you quickly in the event that a Modcabin becomes available: your phone number, arrival and departure dates, and number of people in your party. If a Modcabin becomes available before the arrival date, we will work through the list to see if wait listed guests would like to complete their reservation. We may include a response time limit, after which we will call another guest from the wait list. And here’s the extra fine print… Modcabins accepts no liability and will not pay any compensation where the performance of its obligations is prevented or affected directly or indirectly by or as a result of force majeure or any circumstances beyond its reasonable control including, but not limited to, flood, earthquake, extreme adverse weather conditions, natural disasters, other acts of God, acts of terrorism, fire or failure of electric power, gas, water, or other utility service, plant machinery, computers, vehicles or any collapse of building structures. Modcabins will not be responsible for the loss or damage of any property left in a tiny home other than as required under North Carolina law. Modcabins will not be liable for any indirect, consequential loss or pure economic loss (whether caused by the negligence of the Company, its employees, contractor or agents or otherwise). The Company’s total liability shall not exceed the value of the Contract. Nothing contained in these terms and conditions may be read or construed as excluding any liability for death or personal injury caused by Modcabin’s negligence or liability for fraud or fraudulent misrepresentation. These terms and conditions will be governed by and construed in accordance with the laws of the state of North Carolina, without regard to conflict-of-laws principles.